Custom Fabricated Louvers by Hercules Custom Iron, LLC. Why might you want to install commercial louvers on your property? Think about these four big benefits. 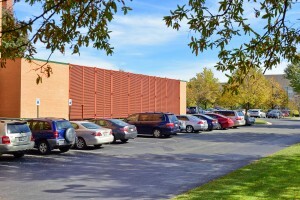 Many people opt to have commercial louvers installed around this time of year. The weather makes it ideal for workers and that means getting the job done is a much quicker affair than it would otherwise be. Commercial louvers offer a number of huge benefits to your facility, but are you aware of all of them? Below, we take a look at four of the biggest reasons you may want to install commercial louvers and how they can benefit your commercial property. If you’re concerned about privacy within your facility, there’s no better option than commercial louvers. They obscure sight while still offering the benefits that fences are known for: the area can still breathe and is outdoors, but it obscures vision effectively. This can lead to a better sense of comfort depending on what the property is. If you need to section off certain areas of your property, louvers can often be an ideal way to do so. In some cases, people going into the wrong areas of a property can actually be dangerous. If you want to control who is able to access what, louvers are a fantastic option to section off some areas and restrict who can enter or exit. For some businesses, looking professional is important. Installing commercial louvers makes your facility look modern and well-equipped which is always a good thing. First impressions can mean everything to potential customers or business partners and louvers are often a great option for doing this. You can choose a number of colors and design options so you can be sure you’re getting exactly what you want or need. Commercial louvers offer both a physical and mental barrier to prevent burglars or other criminals from being able to access your facility. They easily prevent any intruders from getting in while still being open enough to offer some fresh air and ventilation. Working closely with a louver installer helps you to address your specific security needs. When you are ready for quality louvers, the professionals at Hercules Custom Louvers are ready to help. For more information and to learn how we can meet your custom louver needs, contact Hercules Custom Iron online or giving us a call at 1-800-331-2590. We will ensure your investment serves your family for years to come! For updates and to see projects we’re working on, visit us on Facebook, Twitter, LinkedIn, YouTube, Google+, and Pinterest. This entry was posted on Friday, May 25th, 2018	at 3:19 pm	. You can follow any responses to this entry through the RSS 2.0 feed. Both comments and pings are currently closed. Can Louvers Play a Part in Your Commercial Security Plan? Why Should You Choose Custom Louvers Over Other Physical Barriers? Why Does Hercules Use Aluminum For Our Louvers?